Camilla was a bright teenager. She never expected to end up in foster care. However, her father was an alcoholic, and her mother lost her job. The family was unable to keep food in the home. Camilla also had cystic fibrosis, and when the family could not keep their electricity on, it meant that Camilla couldn’t receive her treatment. Camilla remembers that her mother told her that she didn’t know how to make sure Camilla would get the treatment she need. Family Rewritten is a powerful short film from Yasmin Mistry, who adds it to her growing body of work of short films capturing the stories of young adults who have travelled through foster care. Camilla is very honest in Family Rewritten – she was initially ashamed to ask for help, but she found help through her friends, a teacher, and the system. She found a new sense of family in the home of a close friend whose parents decided to take her into placement, and she learned not to be ashamed of her story. Camilla candidly shares some of her deep pain – her father died before she was able to tell him all that he had accomplished, and she reflects on the lack of communication between her and her mother. In spite of what she has experienced, Camilla has found perspective and peace. She has learned that she is not alone, and that she does not need to be ashamed. Family Rewritten is a gripping, impactful film. Camilla’s bravery and perspective could be helpful to foster parents, teens in foster care, and people considering becoming foster parents. 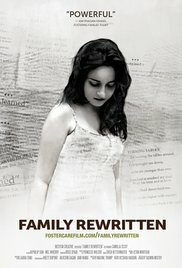 To learn more, check out http://www.fostercarefilm.com/familyrewritten You can also Preorder it!